Looking for a quick template to use to create a standardized task sheet for math stations? One of the ways I like to manage and organize my math stations is by creating a standard game directions page to include with any game that I use, i.e. card and dice games, board games, etc. Taking the time to create these from the start makes it easier for students to locate the directions and get started right away. On the game sheet, I include the following: Concept/Skill, Number of Players, Materials, Objective, and Procedure. To help you organize your stations, I’ve created an editable freebie task sheet for you! 1.) Download the file from Google Drive. 2.) Open the PowerPoint file in Microsoft PowerPoint. 3.) Insert text boxes and add text to create the task sheet. Be sure to add a title! Note: Hello Literacy’s “Hello Doodle Print” font is used in the template. The clipart is courtesy of Krista Wallden. Click here or on the image above to grab a free copy of my editable task sheet. Enjoy! 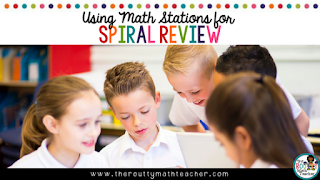 Head on over to The Routty Math Teacher website and check out my “Using Math Stations for Spiral Review” blog post. Read it here!